With rich and smoky atmosphere, anti-Nazi propaganda, Max Steiner's superb musical score, suspense, unforgettable characters (supposedly 34 nationalities are included in its cast) and memorable lines of dialogue (e.g., "Here's lookin' at you, kid," and the inaccurately-quoted "Play it again, Sam"), it is one of the most popular, magical (and flawless) films of all time - focused on the themes of lost love, honor and duty, self-sacrifice and romance within a chaotic world. Woody Allen's Play It Again, Sam (1972) paid reverential homage to the film, as have the lesser films Cabo Blanco (1981) and Barb Wire (1996), and the animated Bugs Bunny short Carrotblanca (1995). The line "Play it again, Sam" appeared in the Marx Brothers' A Night in Casablanca (1946). Clips or references to the film have been used in Play It Again, Sam (1972), Brazil (1985), My Stepmother is an Alien (1988), and When Harry Met Sally (1989). Directed by the talented Hungarian-accented Michael Curtiz and shot almost entirely on studio sets, the film moves quickly through a surprisingly tightly constructed plot, even though the script was written from day to day as the filming progressed and no one knew how the film would end - who would use the two exit visas? [Would Ilsa, Rick's lover from a past romance in Paris, depart with him or leave with her husband Victor, the leader of the underground resistance movement?] And three weeks after shooting ended, producer Hal Wallis contributed the film's famous final line - delivered on a fog-shrouded runway. The sentimental love story, originally structured as a one-set play, was based on an unproduced play entitled Everybody Comes to Rick's by Murray Burnett and Joan Alison - the film's original title. Its collaborative screenplay was mainly the result of the efforts of Julius J. and Philip G. Epstein and Howard Koch. In all, six writers took the play's script, and with the models of Algiers (1938) and Only Angels Have Wings (1939) to follow, they transformed the romantic tale into this quintessential classic that samples almost every film genre. Except for the initial airport sequence, the entire studio-oriented film was shot in a Warner Bros. Hollywood/Burbank studio. Many other 40s stars were considered for the lead roles: Hedy Lamarr, "Oomph Girl" Ann Sheridan, French actress Michele Morgan, and George Raft. And pianist Sam's role (portrayed by "Dooley" Wilson - who was actually a drummer) was originally to be taken by a female (either Hazel Scott, Lena Horne, or Ella Fitzgerald). The lead male part went to Humphrey Bogart in his first romantic lead as the tough and cynical on-the-outside, morally-principled, sentimental on-the-inside cafe owner in Casablanca, Morocco. His appearance with co-star Ingrid Bergman was their first - and last. As a hardened American expatriate, Bogart runs a bar/casino (Rick's Cafe Americain) - a way-station to freedom in WWII French-occupied Morocco, where a former lover (Bergman) who previously 'jilted' him comes back into his life. She is married to a heroic French Resistance leader (Henreid). Stubbornly isolationist, the hero is inspired to support the Resistance movement and give up personal happiness with his past love. The Hollywood fairy-tale was actually filmed during a time of US ties with Vichy France when President Roosevelt equivocated and vacillated between pro-Vichy or pro-Gaullist support. And it was rushed into general release almost three weeks after the Allied landing at the Axis-occupied, North African city of Casablanca, when Eisenhower's forces marched into the African city. Due to the military action, Warner Bros. Studios was able to capitalize on the free publicity and the nation's familiarity with the city's name when the film opened. The big-budget film (of slightly less than $1 million), took in box-office of slightly more than $4 million. It was considered for eight Academy Awards for the year 1943. [Actually, it should have competed against Mrs. Miniver (1942) (the Best Picture winner in the previous year), since it premiered in New York in November of that year. However, because it didn't show in Los Angeles until its general release that January, it was ineligible for awards in 1942, and competed in 1943.] The nominations included Best Actor (Humphrey Bogart), Best Supporting Actor (Claude Rains), Best B/W Cinematography (Arthur Edeson, known for The Maltese Falcon (1941)), Best Score (Max Steiner, known for Gone With the Wind (1939)), and Best Film Editing (Owen Marks). The dark-horse film won three awards (presented in early March of 1944): Best Picture (producer Hal B. Wallis), Best Director, and Best Screenplay. Bogart lost to Paul Lukas for his role in Watch on the Rhine. And Bergman wasn't even nominated for this film, but instead was nominated for Best Actress for For Whom The Bell Tolls (and she lost to Jennifer Jones in The Song of Bernadette). Bogart had made three other films in 1943: Sahara, Action in the North Atlantic, and Thank Your Lucky Stars. And so a torturous, round-about refugee trail sprang up. Paris to Marseilles, across the Mediterranean to Oran [in Algeria], then by train or auto or foot across the rim of Africa to Casablanca in French Morocco. Here the fortunate ones through money or influence or luck might obtain exit visas and scurry to Lisbon, and from Lisbon to the New World. But the others wait in Casablanca, and wait and wait and wait. The camera descends from a mosque into the crowded, stucco-walled coastal city of Casablanca, a way station city (an upscale concentration camp) technically ruled by neutral Unoccupied France - located out of war-torn Europe. The story is set in early December 1941 in a city (and cafe), in a dangerous, far-off locale that is a microcosm of the wartime world. More important details regarding the setting and characters are telescoped very precisely and economically - information about the theft of transit letters, the political and social situation in pro-Vichy Casablanca, the arrival of the Nazi commandant and his friendship with the self-satisfied Vichy policeman, the crucial daily flights to Lisbon, and the central importance of Rick's Cafe. To all officers. Two German couriers carrying important official documents murdered on train from Oran. Murderer and possible accomplices headed for Casablanca. Round up all suspicious characters and search them for stolen document. IMPORTANT. The French police, not the Germans, have the jurisdiction and authority to investigate the crime that occurred in Unoccupied France, a neutral country. The open-air city market, a scene of intrigue, is teeming with black marketeers, smugglers, thieves, spies, double agents and refugees who desperately seek to obtain tickets (exit visas) on the daily plane to neutral Lisbon. During a roundup by the French police, one fleeing civilian suspect (Paul Andor) with expired identification papers who refuses to halt is shot in the back and falls dead beneath a wall poster (Je Tiens Mes Promesses Mem Celles Des Autres - "I Keep My Promises, Just as I Keep the Promises of Others") of Marshal Philippe Petain, the dictatorial French head of state in Vichy France. The suspect dies clutching a resistance handbill bearing the Cross of Lorraine symbol - revealing his membership in the Free France Organization headed by Petain's arch rival, General Charles De Gaulle. The camera pans down from an etched-stone slogan above a doorway: "Liberte, Egalite, Fraternite" (Liberty, Equality, Fraternity), the slogan of the French Republic - an outdated, tarnished sign that hadn't yet been replaced by the Vichy Government. The many suspects are herded into a police-station building bearing the sign: "Palais de Justice." At an open-air cafe, a dark, wiry pickpocket (Curt Bois) preys on an English couple, stranded in the Vichy-controlled area. As he informs them that the "scum of Europe has gravitated to Casablanca" and warns them to "be on guard" for "vultures," he lifts the gentleman's wallet. An arriving plane flies over the rooftop sign of Rick's Cafe Americain as a crowd of refugees covetously watches it pass overhead. Among many faces that turn skyward and yearn for freedom in the Americas, a Bulgarian couple, Jan Viereck (Helmut Dantine) and Annina Brandel (Joy Page) hopefully wonder aloud: "Perhaps tomorrow, we'll be on the plane." Renault: Unoccupied France welcomes you to Casablanca. Strasser: Thank you, Captain. It's very good to be here...(Renault introduces his aide Lt. Casselle, and is brusquely intruded upon by Italian Capt. Tonelli.) You may find the climate of Casablanca a trifle warm, Major. Strasser: Oh, we Germans must get used to all climates, from Russia to the Sahara. But perhaps you were not referring to the weather. Renault: What else, my DEAR Major? The camera eavesdrops on various groups found at different tables to introduce the activities of those stranded in Casablanca. Refugees attempt to escape from Nazi pursuit, hidden by the jovial, hectic and festive atmosphere in the cafe. Shady deals are being made by greedy black marketeers and the desperate, hopeful clientele of all classes and races speaking in various accents. One man bemoans the endless waiting to leave Casablanca: "Waiting, waiting, waiting. I'll never get out of here. I'll die in Casablanca." A woman sells her smuggled diamonds in a glutted market to a Moor: "But can't you make it just a little more, please?" She accepts 2,400 in Moroccan francs (about $72) as the price. In hushed tones, others make secretive travel arrangements to get out: "The trucks are ready. The men are waiting." At another table, a man tells a second man about escaping on the fishing smack Santiago: "It leaves at 1:00 tomorrow night, here from the end of the Medina. Third boat...and bring 15,000 francs - in cash. Remember, in cash." The camera quickly pans by two Chinese refugees speaking an Oriental language to each other. Carl: Madame, he never drinks with customers. Never. I have never seen it. Female companion: What makes saloonkeeper so snobbish? Gentleman: Perhaps if you told him I ran the second largest banking house in Amsterdam. Gentleman: We have something to look forward to. Carl: -- and his father is the bellboy! Cynical, disillusioned, embittered, self-centered, and an exiled loner, Richard "Rick" Blaine (Humphrey Bogart) makes a delayed entrance in the film - in a foreground closeup, only his hand is first viewed scrawling/scribbling a signature of authorization/approval across a check for an advance of 1,000 francs: "OK - Rick." Then, the camera reveals the objects in front of him - an ashtray with a smoldering cigarette, an empty glass, a chess board, and a pen. It slowly follows his arm up to his immaculate white tuxedo to his sober face as he drags on his cigarette. Presiding over the gambling tables in the gaming room, Rick drinks and sits by himself, playing a solitary game of chess. His main functions in the casino are to sign checks and vouchers and to occasionally break up fights. Expressionless, he has learned how to survive and be vigilant in the hostile environment. Rick: Your cash is good at the bar. German: What? Do you know who I am? Rick: I do. You're lucky the bar's open to you. German: This is outrageous. I shall report it to the Angriff. Ugarte: You know, Rick, watching you just now with the 'Deutschebank' [the German banker], one would think you'd been doing this all your life. Rick: Oh, what makes you think I haven't? Ugarte: What right do I have to think?.. (hypocritically) Too bad about those two German couriers, wasn't it? Rick: (disparagingly) They got a lucky break. Yesterday, they were just two German clerks. Today, they're the Honored Dead. Ugarte: You are a very cynical person, Rick, if you forgive me for saying so. Ugarte: You despise me, don't you? Rick: Well, if I gave you any thought, I probably would. Ugarte: But why? Oh, you object to the kind of business I do, huh? But think of all those poor refugees who must rot in this place if I didn't help them. Well that's not so bad, through ways of my own, I provide them with exit visas. Rick: For a price, Ugarte, for a price. Ugarte: But think of all the poor devils who can't meet Renault's price. I get it for them for half. Is that so parasitic? Rick: I don't mind a parasite. I object to a cut-rate one. Ugarte: Well, Rick, after tonight, I'll be through with the whole business, and I'm leaving finally, this Casablanca. Rick: (quipping) Who'd you bribe for your visa, Renault or yourself? Ugarte shows Rick two non-rescindable French General-signed letters of transit out of Casablanca that allow their possessor to travel without a regular passport or visa. [The pronunciation of the General's name is muffled - whether the irrevocable letters of transit were signed by General Charles DeGaulle or General Maxime Weygand, the military-Vichy commander in French N. Africa, is in question. Weygand would be the more accurate and likely one to issue irrevocable letters of transit - although they probably never existed.] His display of the visas insinuates that he killed the German couriers. His plan is to sell them and make a fortune - "more money than even I have ever dreamed of." Chain-smoking nervously, small-time operator Ugarte trusts only Rick and explains his criteria with an ironic compliment: "You know Rick, I have many a friend in Casablanca, but somehow, just because you despise me you are the only one I trust." Ugarte temporarily entrusts the letters of transit with the trustworthy cafe proprietor. Ugarte hopes that Rick admires him: "Rick, I hope you are more impressed with me now, huh?" With a slight sneer on his face, Rick tells Ugarte that he has heard a rumor that the two murdered German couriers were carrying letters of transit - implying that Ugarte was involved in their demise. Ugarte commiserates sarcastically: "Oh, I've heard that rumor too. Poor devils." Rick compliments Ugarte: "Yes, you're right, Ugarte. I am a little more impressed with you," referring to Ugarte's bold murders to get the exit visas, as well as a little disgust that he would have gone so far. Rick hides the two priceless letters of transit for him, secretly stashing them in the club's upright piano while Sam sings and plays: "Who's Got Trouble? - Knock on Wood" - the song title provides commentary that is pregnant with meaning. Rick: It's not for sale. Ferrari: You haven't heard my offer. Rick: It's not for sale at any price. Ferrari: What do you want for Sam? Rick (looking down and with understatement): I don't buy or sell human beings. Ferrari: Too bad. That's Casablanca's leading commodity. In refugees alone, we could make a fortune, if you work with me through the black market. Rick: Suppose you run your business and let me run mine. Ferrari: Suppose we ask Sam. Maybe he'd like to make a change? Ferrari: My dear Rick, when will you realize that in this world, today, isolationism is no longer a practical policy? Sam is asked about his loyalties, and steadfastly wishes to remain with Rick ("I like it fine here"). Rick is ultimately detached from politics. How extravagant you are - throwing away women like that. Some day they may be scarce. Oh, I think now I shall pay a call on Yvonne, maybe get her on the rebound, huh? Rick politely calls Renault promiscuous: "When it comes to women, you're a true democrat." Renault: You would like to be on it? Rick: Why? What's in Lisbon? Renault: The Clipper to America. Renault: I've often speculated why you don't return to America. Did you abscond with the church funds? Did you run off with a Senator's wife? I like to think that you killed a man. It's the romantic in me. Rick: It's a combination of all three. Rick (laconically): I was misinformed. Rick is summoned into the cafe by his croupier Emil (Marcel Dalio), who apologizes for losing 20,000 francs to one of the betting customers. Renault: Rick, there are many exit visas sold in this cafe, but we know that you've never sold one. That is the reason we permit you to remain open. Rick: I thought it was because I let you win at roulette. Renault: That is another reason. There is a man (who's) arrived in Casablanca on his way to America. He will offer a fortune to anyone who will furnish him with an exit visa. Rick: (with a flat, disinterested tone) Yeah? What's his name? A well-known Czechoslovakian Resistance leader and freedom fighter, Victor Laszlo, who escaped from a German concentration camp, will be arriving imminently. Renault is surprised that Rick's expression changes with the mention of Laszlo's name - Rick is "impressed" - knowing of his great reputation, his escape, and his flight from Nazis all over Europe: "He succeeded in impressing half the world." However, Renault has orders that he must fulfill - counter to Rick's admiration: "It's my duty to see that he doesn't impress the other half. Rick, Laszlo must never reach America. He stays in Casablanca." Rick speculates about the fate of Laszlo: "It'll be interesting to see how he manages.... - his escape." I'm only a poor corrupt official. Renault: No matter how clever he is, he still needs an exit visa, or I should say, two. Renault: He is traveling with a lady. Renault: I think not. I have seen the lady and if he did not leave her in Marseilles or in Oran, he certainly won't leave her in Casablanca. Rick: Well, maybe he's not quite as romantic as you are. Renault: Because my dear Ricky, I suspect that under that cynical shell, you're at heart a sentimentalist...Oh, laugh if you will, but I happen to be familiar with your record. Let me point out just two items. In 1935, you ran guns to Ethiopia. In 1936, you fought in Spain on the Loyalists' side. Rick: And got well paid for it on both occasions. Renault: The winning side would have paid you much better. Major Strasser's arrival interrupts their conversation - downstairs, Carl tells Renault that he has already offered the Gestapo official one of the best tables - one close to the ladies: "I have already given him the best - knowing he is German and would take it anyway." Renault introduces the Nazi Major to the pleasures found at Rick's Cafe - French wine and a tin of Russian caviar. The successful display of the French's swift detainment of the criminal pleases Renault immensely. Strasser: What is your nationality? Renault: And that makes Rick a citizen of the world. Rick: I was born in New York City if that'll help you any. Strasser: I understand that you came here from Paris at the time of the occupation. Rick: Well, there seems to be no secret about that. Strasser: Are you one of those people who cannot imagine the Germans in their beloved Paris? Rick: Not particularly my beloved Paris. Heinze: Can you imagine us in London? Strasser: Well, how about New York? Rick: Well, there are certain sections of New York, Major, that I wouldn't advise you to try to invade. Strasser: Uh, huh. Who do you think will win the war? Rick: I haven't the slightest idea. Renault: Rick is completely neutral about everything. And that takes in the field of women, too. Strasser: You are not always so carefully neutral? We have a complete dossier on you. Richard Blaine, American, age 37, cannot return to his country - the reason is a little vague. Rick: My interest in whether Victor Laszlo stays or goes is purely a sporting one. Strasser: In this case, you have no sympathy for the fox, huh? Rick: Not particularly. I understand the point of view of the hound, too. Strasser: Victor Laszlo published the foulest lies in the Prague newspapers until the very day we marched in, and even after that, he continued to print scandal sheets in a cellar. Renault: Of course, one must admit he has great courage. Strasser: I admit he's very clever. Three times he slipped through our fingers. In Paris, he continued his activities. We intend not to let it happen again. Rick: Excuse me, gentlemen. Your business is politics. Mine is running a saloon. Rick prefers to wait for World War II to end, although he deceives himself - he still conceals (like the hidden exit visas) some anti-Fascist bitterness behind his cafe entrepreneurship. Renault shows his friendly affection for Rick, assuring the Major: "You have nothing to worry about Rick." Just then, the pursued, lean French-Resistance leader, Czechoslovakian Victor Laszlo (Paul Henreid), and his beautiful "companion," the radiant but furtive Ilsa Lund (Ingrid Bergman), enter Rick's cafe and gambling house. She is wearing an elegant, pure and noble, well-tailored white dress [as she does in almost every scene] and he is in an off-white suit. After announcing authoritatively: "I reserved a table. Victor Laszlo," the couple are led to a seat at their reserved table - their white outfits contrast sharply to the dark-black uniform of the headwaiter. Sam and Ilsa appear to recognize each other - with trepidation - as she passes by, keeping in step with Laszlo. [He begins playing Love For Sale on the piano. Is she already suspicious that Rick and Sam have both ventured into N. Africa together after she passed under the lit sign of the cafe that identified Rick as the owner?] When seated, Laszlo mentions in a hushed voice that he is looking for Ugarte. Ilsa is visibly nervous, and her first words convey fear of both her past and their present danger: "I feel somehow we shouldn't stay here." The Resistance leader remains courteous, but the seasoned Resistance leader bears a small two-inch scar over his right eye, the result of his recent escape and flight across Europe. Renault: I was informed you were the most beautiful woman ever to visit Casablanca. That was a gross understatement. Renault orders champagne and caviar: "A bottle of your best champagne and put it on my bill." Laszlo objects, but Renault explains: "It's a little game we play. They put it on the bill. I tear up the bill. It is very convenient." Renault: He came from Paris, with Rick. Laszlo: I'm sure you'll excuse me if I'm not gracious. But you see Major Strasser, I'm a Czechoslovakian. Strasser: You were a Czechoslovakian. Now you are a subject of the German Reich. Laszlo (rising confrontationally): I've never accepted that privilege and I'm now on French soil. After exchanging a few bitter, offensive and hostile words to each other, Strasser demands a discussion of "the matters arising from your presence on French soil," and orders Laszlo to be questioned at the Prefet's office the next morning at ten - "with Mademoiselle." Victor is worried: "This time, they really mean to stop me." Likewise, Ilsa is dreadfully fearful of their precarious situation: "Victor, I'm afraid for you." At the bar while drinking champagne cocktails, Laszlo is dismayed when told by Berger that the source of their exit visas, Ugarte, has already been taken into police custody, after his arrest for murder earlier that evening in the cafe. Berger invites Laszlo to the next evening's Underground resistance meeting. Sam: I don't know. I ain't seen him all night. Ilsa: When will he be back? Sam: Not tonight no more. He ain't comin'...He went home. Ilsa: Does he always leave so early? Sam: Oh, he never..., well, he's got a girl up at the Blue Parrot. He goes up there all the time. Ilsa: (She turns away and reaches for her champagne glass.) You used to be a much better liar, Sam. Sam: Leave him alone, Miss Ilsa. You're bad luck to him. Ilsa: Play it once, Sam, for old times' sake. Sam: I don't know what you mean, Miss Ilsa. Sam: Why, I can't remember it, Miss Ilsa. I'm a little rusty on it. Ilsa: I'll hum it for you. (Ilsa hums two bars. Sam starts to play - without singing the lyrics. She presses him to sing.) Sing it, Sam. And then the music pauses - and Rick is startled and dumbfounded by the sight of Ilsa - they exchange a long, shocked look, the first time they have seen each other after many years. Sam quickly stacks his piano bench on top of the piano and wheels it away. Laszlo: This is a very interesting cafe. I congratulate you. Rick: And I congratulate you. Laszlo: Thank you. I try. Rick: We all try. You succeed. Renault: I can't get over you two. She was asking about you earlier, Rick, in a way that made me extremely jealous. Rick (finishing her sentence) La Belle Aurore. Ilsa: How nice. You remembered. But of course, that was the day the Germans marched into Paris. Rick: Not an easy day to forget. Rick: I remember every detail. The Germans wore grey. You wore blue. Ilsa: Yes. I put that dress away. When the Germans march out, I'll wear it again. Renault: Ricky, you're becoming quite human. I suppose we have to thank you for that, Mademoiselle. Victor: A very puzzling fellow, this Rick. What sort is he? Ilsa: (non-chalantly, while looking straight ahead) Oh, I really can't say, though I saw him quite often in Paris. She passes through a shadow as she tells this half-truth. They meet up with Renault, who reminds them of their appointment with him the next day in the Prefet's office. As they step into their cab, a close-up shows Renault's sinister face, illuminated as he smokes a cigarette. His ambiguous reaction to their arrival and presence in Casablanca is underlined by shadows and light. They grab Ugarte. Then she walks in. Well, (that's) the way it goes. One in, one out...(To Sam) It's December 1941 in Casablanca. [This is a retrospective warning about Pearl Harbor] What time is it in New York?...I bet they're asleep in New York. I bet they're asleep all over America. Rick: What's that you're playin? Sam: Oh, just a little somethin' on my own. Rick: Well, stop it! You know what I want to hear. Rick: You played it for her, you can play it for me. Rick: If she can stand it, I can. Play it! As variations of As Time Goes By play, the camera blurs into a dissolve from his face into a flashback - it takes him back to memories of happier times in a whirlwind romance with Ilsa in pre-Occupation Paris where they were in love before the German invasion. It is a bittersweet account of their ill-fated time together. He revisits the past to resist the explanation that he knows she will bring for her betrayal of him in Paris. He is still in love with her and feeling rejection after she abandoned him, her beloved, in Paris without explanation. Rick: Who are you really and what were you before? What did you do and what did you think, huh? Ilsa: We said no questions. Ilsa: A franc for your thoughts. Rick: In America, they bring only a penny. I guess that's about all they're worth. Ilsa: But, I'm willing to be overcharged. Tell me. Rick: Why I'm so lucky, why I should find you waiting for me to come along? Ilsa: That's easy. There was. And he's dead. Rick: I'm sorry for asking. I forgot we said no questions. Ilsa (frightened): Richard, they'll find out your record. It won't be safe for you here. Rick (smiles): I'm on their blacklist already, their roll of honor. Ilsa: They're telling us how to act when they come marching in. With the whole world crumbling we pick this time to fall in love. Rick: Yeah, it's pretty bad timing. Where were you, say, ten years ago? Ilsa: Ten years ago? Let's see, yes, I was having a brace put on my teeth. Where were you? Rick: Looking for a job. Was that cannon fire or is it my heart pounding? Kiss me. Kiss me as if it were the last time. The camera moves to reveal that Ilsa's fist has dropped and tipped over her champagne glass - symbolizing the strength of her anger at fate - and the end of her happy times with Rick. The onset of World War II is brilliantly juxtaposed with the split in their personal relationship. Ilsa: I wouldn't have come if I'd known that you were here. Believe me, Rick. It's true. I didn't know. Ilsa: Please don't. Don't Rick! I can understand how you feel. Rick: Huh! You understand how I feel. How long was it we had, honey? Ilsa: I didn't count the days. Rick: Well I did. Every one of them. Mostly, I remember the last one. The wow finish. A guy standing on a station platform in the rain with a comical look on his face, because his insides had been kicked out. Rick: Does it got a wow finish? Ilsa: I don't know the finish yet. Rick: Go on and tell it. Maybe one will come to you as you go along. Yes, it's very pretty. I heard a story once. As a matter of fact, I've heard a lot of stories in my time. They went along with the sound of a tinny piano, playing in the parlor downstairs. 'Mister, I met a man once when I was a kid,' they'd always begin. Well, I guess neither one of our stories is very funny. Tell me, who was it you left me for? Was it Laszlo or were there others in between? Or aren't you the kind that tells? Ilsa, with a tear running down her cheek and without a further word, leaves Rick slumped down and collapsed on the table with his head in his hands. Strasser: I strongly suspect that Ugarte left the letters of transit with Mr. Blaine. I would suggest you search the cafe immediately and thoroughly. Renault: If Rick has the letters, he's much too smart to let you find them there. Strasser: You give him credit for too much cleverness. My impression was that he's just another blundering American. When Victor and Ilsa arrive, Strasser tells Victor, "an escaped prisoner of the Reich," that he will definitely not receive an exit visa out of Casablanca. Strasser attempts to intimidate the defiant, elusive resistance leader: "So far, you have been fortunate enough in eluding us. You have reached Casablanca - it is my duty to see that you stay in Casablanca." Laszlo doesn't intimidate easily: "Whether or not you will succeed is, of course, problematical." If I didn't give them to you in a concentration camp, where you had more persuasive methods at your disposal, I certainly won't give them to you now. And what if you track down these men and kill them? What if you murdered all of us? From every corner of your Republic, thousands would rise to take our places. Even Nazis can't kill that fast. Threateningly, Strasser informs Laszlo that no one could take his place "in the event anything unfortunate should occur to you." Strasser adds that Ugarte is dead - and Renault admits that there was foul play involved: "I'm making out the report now. We haven't quite decided whether he committed suicide or died trying to escape." After the two have left ("undoubtedly...to the black market" to obtain a visa), another "visa problem" is presented to Renault - the police chief straightens his tie and responds: "Show her in." Ferrari: There's something I want to talk over with you, anyhow. (He hails a waiter) The bourbon. Ah. The news about Ugarte upsets me very much. Rick: You're a fat hypocrite. You don't feel any sorrier for Ugarte than I do. Ferrari: Of course not. What upsets me is the fact that Ugarte is dead and no one knows where those letters of transit are. Last night, I saw what has happened to you. The Rick I knew in Paris I could tell him, he'd understand. But the one who looked at me with such hatred - I'll be leaving Casablanca soon and we'll never see each other again. We knew very little about each other when we were in love in Paris. If we leave it that way, maybe we'll remember those days and not Casablanca. Not last night. Walk up a flight. I'll be expecting you. All the same, someday you'll lie to Laszlo - you'll be there. But then she reveals the well-kept secret that Victor was her husband all along, even in Paris: "No, Rick. No, you see, Victor Laszlo's my husband and was, even when I knew you in Paris." Abruptly, Ilsa walks away from a subdued, speechless and stunned Rick. It is his first knowledge that she was married during their aborted affair in Paris [She was apparently unfaithful, although she sincerely believed that her 'husband' was dead]. Victor and Ilsa helplessly ask for assistance from Senor Ferrari in leaving Casablanca. With wide and innocent eyes this time, he tells them that Ilsa will be the only one able to leave and he may be able to help smuggle her out. As leader of all the illegal activities in Casablanca, I'm an influential and respected man, but it would not be worth my life to do anything for Monsieur Laszlo. You, however, are a different matter. During their conversation, Victor's goal changes to one of acquiring an exit visa for Ilsa, not for himself, and Ilsa responds that she is uncertain about abandoning him: "You mean for me to go on alone?" Word has gotten around that it is too risky to find an exit visa for Victor, because frankly, "it would take a miracle to get you out of Casablanca, and the Germans have outlawed miracles." They decide that Ilsa will not go alone ahead of Victor to America (because he never abandoned her in the past), and that they will continue searching for two exit visas. I observe that you are in one respect a very fortunate man, Monsieur. I am moved to make one more suggestion, why, I do not know, because it cannot possibly profit me. Have you heard about Senor Ugarte and the letters of transit?...Those letters were not found on Ugarte when they arrested him...I'd venture to guess that Ugarte left those letters with Monsieur Rick...He's a difficult customer, that Rick. One never knows what he'll do or why, but it is worth a chance. Renault: Rick, have you got those letters of transit? Rick: Louis, are you pro-Vichy or Free French? Rick: So Yvonne's gone over to the enemy. Renault: Who knows? In her own way, she may constitute an entire second front. Yvonne's boyfriend orders a French 75 drink at the bar, a drink named after a 75 mm French cannon weapon. Rick decisively breaks up a fight "disturbance" that erupts between the German officer and a uniformed Frenchman at the bar: "...in my place, you either lay off politics or get out." Strasser: You are concerned about more than Casablanca. We know that every French province in Africa is honey-combed with traitors waiting for their chance, waiting, perhaps, for a leader. Renault: A leader - like Laszlo? Annina: What kind of a man is Captain Renault? Annina: No, I mean - is he trustworthy? Is his word...? Annina: We come from Bulgaria. Oh, things are very bad there, Monsieur. The devil [dictatorial Tsar Boris III] has the people by the throat. So, Jan and I we - we do not want our children to grow up in such a country. Rick: (He rubs the center of his forehead with two fingers.) So you decided to go to America. Annina: Yes. But we have not much money and...traveling is so expensive and difficult. It was much more than we thought to get here. And then Captain Renault sees us, and he is so kind. He wants to help us. Annina: He tells me you can give us an exit visa, but, but we have no money. Rick: Does he know that? Rick: And he's still willing to give you a visa? Annina: Will he keep his word? Annina: Oh! (relieved) Monsieur. You are a man. If someone loved you very much, so that your happiness was the only thing that she wanted in the world, but she did a bad thing to make certain of it, could you forgive her? Annina: And he never knew. And the girl kept this bad thing locked in her heart. That would be all right, wouldn't it? Rick: You want my advice. Rick: Go back to Bulgaria. Annina: Oh, but if you knew what it means to us to leave Europe, to get to America. Oh, but if Jan should find out. He is such a boy. In many ways, I am so much older than he is. 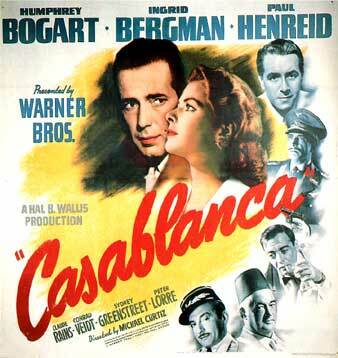 Rick: Yes, well, everybody in Casablanca has problems. Yours may work out. Ilsa and Victor arrive at Rick's cafe on their second night in Casablanca - Ilsa wears a dark, paisley-patterned dress. Rick greets them courteously and observes that Sam's playing must bring memories of Paris in "happier days" to Ilsa. She confirms that it does, and requests a table close to Sam's piano: "Could we have a table close to him?" Laszlo adds: "And as far away from Major Strasser as possible." Rick takes care of seating arrangements even though "the geography may be a little difficult to arrange." He asks that Sam play Ilsa's "favorite tune" - As Time Goes By. Renault: Why do you interfere with my little romances? Rick: Put it down as a gesture to love. Renault: I'll forgive you this time but I'll be in tomorrow night with a breathtaking blonde. And it'll make me very happy if she loses. Laszlo: You must know it's very important I get out of Casablanca. It's my privilege to be one of the leaders of a great movement. Do you know what I've been doing? Do you know what it means to the work - to the lives of thousands and thousands of people that I be free to reach America and continue my work. Rick: I'm not interested in politics. The problems of the world are not in my department. I'm a saloon keeper. Laszlo: My friends in the Underground tell me that you've got quite a record. You ran guns to Ethiopia. You fought against the Fascists in Spain. Laszlo: Isn't it strange that you always happen to be fighting on the side of the underdog? Rick: Yes, I found that a very expensive hobby too, but then I never was much of a businessman. Laszlo: Are you enough of a businessman to appreciate an offer of a hundred thousand francs? Rick: I appreciate it, but I don't accept it. Laszlo: I'll raise it to two hundred thousand. Rick: My friend, you could make it a million francs or three. My answer would still be the same. Laszlo: There must be some reason why you won't let me have them [the exit visas]. Rick: There is! I suggest that you ask your wife. Laszlo: I beg your pardon. Mugir ces féroces soldats? Ils viennent jusques dans vos bras. In a memorable, melodramatic duel of anthems sung in opposition, the Germans are drowned out by the Free French audience as the accelerated rhythmic editing increases the scene's intensity as it builds toward its climax. Everyone at the cafe pours their hearts into the singing of the song, except for two individuals - Rick and Ilsa. In two closeups, she gazes at Victor in a state of awe, fear and prideful admiration, forgetting to sing. Yvonne, who has been sitting at the bar with her German officer, shouts: "Vive la France!" at its stirring conclusion amidst wild applause. Renault: I'm shocked, shocked to find that gambling is going on in here. Renault: Oh. Thank you very much. Everybody out at once. Renault is handed his gambling winnings by the croupier as he finishes his pronouncements. Confronting Ilsa without Laszlo at her side, Major Strasser (with a lascivious and sinister look) intimidates Ilsa and threatens her with Laszlo's death unless the resistance leader returns to occupied France "under safe conduct" from himself. Bravely and steadfastly, she questions the validity or safety of his guarantee. As he parts, the stern Major offers two alternatives for Victor Laszlo - explained bluntly: (1) placement in a "concentration camp" by French authorities, or (2) death. My dear Mademoiselle, perhaps you have already observed that in Casablanca, human life is cheap. Good night, Mademoiselle. Ilsa: Did he give any reason? Victor: He suggested I ask you. Victor: Yes. He said, 'Ask your wife.' I don't know why he said that. Victor: Were you lonely in Paris? Ilsa: Yes, Victor, I was. Victor: I know how it is to be lonely. Is there anything you wish to tell me? Ilsa: No, Victor, there isn't. Victor: I love you very much, my dear. Ilsa: Yes, yes I know. Then with sparkling glimmers of tears in her eyes, Ilsa decides to take matters into her own hands and go see Rick to obtain the letters: "Victor, whatever I do, will you believe that I..." [Her words to him paraphrase the final statement made to Rick in the rain-soaked letter: "Just believe that I love you."] Her sentence is interrupted - Laszlo expresses his faith in her: "You don't even have to say it. I'll believe." As he departs for the meeting, he gives her a pair of passion-less kisses on her right cheek. Rick: Your unexpected visit isn't connected by any chance with the letters of transit. It seems as long as I have those letters, I'll never be lonely. Ilsa: You can ask any price you want, but you must give me those letters. Rick: I went all through that with your husband. It's no deal. Ilsa: I know how you feel about me, but I'm asking you to put your feelings aside for something more important. Rick: Do I have to hear again what a great man your husband is? What an important Cause he's fighting for? Ilsa: It was your cause too. In your own way, you were fighting for the same thing. Rick: I'm not fighting for anything anymore except myself. I'm the only Cause I'm interested in. Rick: I wouldn't bring up Paris if I were you. It's poor salesmanship. Ilsa: Please, please listen to me. If you knew what really happened. If you only knew the truth. Rick: I wouldn't believe you no matter what you told me. You'd say anything now to get what you want. Ilsa (scornfully): You want to feel sorry for yourself, don't you? With so much at stake, all you can think of is your own feeling. One woman has hurt you and you take your revenge on the rest of the world. You're a, you're a coward and a weakling. (She breaks down sobbing.) No. Oh Richard, I'm sorry. I'm sorry, but, but you, you are our last hope. If you don't help us, Victor Laszlo will die in Casablanca. Ilsa: All right, I tried to reason with you. I tried everything. Now I want those letters. Get them for me. Rick: I don't have to. I got 'em right here. Ilsa: Put them on the table. Ilsa: For the last time, put them on the table. Rick: If Laszlo and the Cause mean so much to you, you won't stop at anything. All right, I'll make it easier for you. Go ahead and shoot. You'll be doing me a favor. Richard, I tried to stay away. I thought I would never see you again, that you were out of my life. The day you left Paris, if you knew what I went through. If you knew how much I loved you, how much I still love you. Laszlo was her husband and she was in fact married even when she knew Rick in Paris. Her husband went to Prague and was arrested. After months of waiting for word of him, she was informed that he had been shot in a concentration camp escape attempt. Then she met Rick in Paris and fell in love: "I was lonely. I had nothing, not even hope. Then I met you." Her marriage with Laszlo had been kept a secret: "Victor wanted it that way. Not even our closest friends knew about our marriage. That was his way of protecting me. I knew so much about his work. And if the Gestapo found out I was his wife, it would be dangerous for me and for those working with us." And then she learned Laszlo was alive the day of their scheduled departure from Paris. With Victor being hidden in a freightcar on the outskirts of Paris, he was so ill that Ilsa had to cancel her plans to leave Paris with Rick to help her husband regain his health: "He was sick. He needed me." Ilsa knew that she couldn't tell Rick why she remained: "I knew you wouldn't have left Paris and the Gestapo would have caught you." She also had to remain true to her marriage vows and choose her husband over her lover. Rick: But it's still a story without an ending. What about now? Ilsa: Now? I don't know. I know that I'll never have the strength to leave you again. Ilsa: Oh, you'll help him now, Richard, won't you? You'll see that he gets out? Then he'll have his work, all that he's been living for. Rick: All except one. He won't have you. Ilsa: I wish I didn't love you so much. In a disturbance downstairs in the darkened, closed cafe, Carl arrives with Victor, who has been wounded in the police raid on the Resistance meeting. After going to investigate from the upstairs balcony, Rick privately instructs Carl to take "Miss Lund" to her hotel room through a side door so that Laszlo won't know of their meeting. As Carl sneaks Ilsa away, Rick engages Laszlo in a conversation and a drink to stall for time - and hears again of the Czech's firm belief in the "good" of the Cause. Rick: Don't you sometimes wonder if it's worth all this? I mean, what you're fighting for. Laszlo: You might as well question why we breathe. If you stop breathing, we'll die. If we stop fighting our enemies, the world will die. Rick: And what of it? It'll be out of its misery. Laszlo: Do you know how you sound, Mr. Blaine? Like a man who's trying to convince himself of something he doesn't believe in his heart. Each of us has a destiny - for good or for evil. Laszlo: I wonder if you do. I wonder if you know that you're trying to escape from yourself, and that you'll never succeed. Laszlo: I know a good deal more about you than you suspect. I know, for instance, that you are in love with a woman. It is perhaps a strange circumstance that we both should be in love with the same woman. The first evening I came into this cafe, I knew there was something between you and Ilsa. Since no one is to blame, I, I demand no explanation. I ask only one thing. You won't give me the letters of transit. All right. But I want my wife to be safe. I ask you as a favor to use the letters to take her away from Casablanca. Laszlo: Apparently, you think of me only as a leader of a Cause. Well, I am also a human being. Yes, I love her that much. Moments later, French gendarmes, presumably at Major Strasser's instigation, burst in through the cafe doors and arrest Laszlo on a "petty charge," as Rick intones: "It seems that destiny has taken a hand." I intend using them myself. I'm leaving Casablanca on tonight's plane. The last plane...I'm taking a friend with me, one you'll appreciate...Ilsa Lund. That ought to put your mind to rest about my helping Laszlo escape, the last man I want to see in America. The normally unflappable Capitaine chain-smokes relentlessly throughout the scene, highlighting the tension. In addition to stealing away unimpeded with Laszlo's wife (a scandalous act that is tantalizingly fascinating to Renault), Rick further wants to put Laszlo away for good in another German death camp. He schemes and orchestrates a deal with Renault to promote good will with Strasser. The deal would be to frame Laszlo on a bigger charge (of possessing the letters of transit) that would betray the Resistance leader to the police and keep him "in a concentration camp for years. It would be quite a feather in your cap, wouldn't it?" Renault catches himself while agreeing: "Germany, uh, Vichy would be very grateful." Renault: There's still something about this business I don't quite understand. Miss Lund, she's very beautiful, yes. But you were never interested in any woman. Renault: I see. How do I know you'll keep your end of the bargain? Rick: I'll make the arrangements right now with Laszlo in the visitor's pen. Renault: Ricky, I'm gonna miss you. Apparently, you're the only one in Casablanca who has even less scruples than I. In the Blue Parrot, Rick arranges to sell his cafe to Ferrari to prepare for his departure to Lisbon (and America) with Ilsa. Rick is assured that all his employment agreements with his workers (Abdul, Carl, and Sascha) will remain the same and Sam will receive "twenty-five percent of the profits"). Ilsa: Richard, Victor thinks I'm leaving with him. Haven't you told him? Ilsa: But it's all right. You were able to arrange everything? Rick: Everything is quite all right. Rick: We'll tell him at the airport. (prophetically) The less time to think, the easier for all of us. Please trust me. Laszlo enters the cafe and thanks Rick profusely for his efforts to help. He also gratefully offers to pay Rick for the letters, but Rick refuses his payment: "Keep it. You'll need it in America." Rick: You won't have any trouble in Lisbon, will you? Laszlo: No, it's all arranged. Oh, you're surprised about my friend, Ricky. The explanation is quite simple. (flippantly and delightedly) Love, it seems, has triumphed over virtue. Renault: (quipping) That is my least vulnerable spot. Renault informs airport officials to expect and grant safe passage for two passengers with letters of transit from Casablanca to Lisbon ("There's to be no trouble about them"). Unbeknownst to Rick, he has craftily dialed Major Strasser's number and alerted him to the escape. Strasser receives the call in his German Commission of Justice office where a portrait of Adolf Hitler hangs on the wall behind him. Realizing there is trouble, Strasser orders Heinze to get his car, and then phones the office of the Prefet of Police and orders a squad of police to meet him at the airport - at once. In the airport's hangar in the film's final departure scene, the plane is readied to take off in ten minutes in the misty fog: "Visibility: one and one half miles. Light ground fog. Depth of fog approximately five hundred. Ceiling unlimited." Rick, Renault, Laszlo, and Ilsa drive up in a government vehicle. Wearing a hat and trenchcoat (in which he conceals a gun in his right hand), Rick orders Renault to have an orderly get Laszlo's luggage and load it on the plane. As Laszlo walks away to make luggage arrangements, Rick orders Renault to write the names of the married couple - the names are Mr. and Mrs. Victor Laszlo - on the letters of transit. Ilsa: But, why my name, Richard? Ilsa: I don't understand. What about you? Rick: Now, you've got to listen to me. Do you have any idea what you've have to look forward to if you stayed here? Nine chances out of ten we'd both wind up in a concentration camp. Isn't that true, Louis? Renault: I'm afraid Major Strasser would insist. Ilsa: You're saying this only to make me go. Rick: I'm saying it because it's true. Inside of us, we both know you belong with Victor. You're part of his work, the thing that keeps him going. Rick: If that plane leaves the ground and you're not with him, you'll regret it. Rick: Maybe not today, and maybe not tomorrow, but soon, and for the rest of your life. Rick (romantically): We'll always have Paris. We didn't have - we'd - we'd lost it until you came to Casablanca. We got it back last night. Rick: And you never will. I've got a job to do too. Where I'm going, you can't follow. What I've got to do, you can't be any part of. Ilsa, I'm no good at being noble, but it doesn't take much to see that the problems of three little people don't amount to a hill of beans in this crazy world. Someday you'll understand that. (She drops her head tearfully. He touches her chin and raises it to gently bolster her up.) Now, now. Here's looking at you, kid. She tried everything to get them, and nothing worked. She did her best to convince me that she was still in love with me, but that was all over long ago. For your sake, she pretended it wasn't, and I let her pretend. Rick vindicates Victor's faith in him - Laszlo responds sympathetically that he accepts and understands Rick's explanation regarding his wife's faithfulness. He is presented with the exit visas, and then shakes Rick's hand as a new member of the committed and collective Pan-European underground movement: "Welcome back to the fight. This time, I know our side will win." Good-bye, Rick. God Bless You. Renault: Well, I was right. You are a sentimentalist...What you just did for Laszlo, that fairy tale you invented to send Ilsa away with him. I know a little about women, my friend. She went, but she knew you were lying. Rick: Anyway, thanks for helping me out. Renault: I suppose you know this isn't going to be very pleasant for either of us, especially for you. I'll have to arrest you, of course. Rick: As soon as the plane goes, Louis. A determined Major Strasser breathlessly rushes into the airport hangar and is informed that Victor Laszlo is on the departing airplane. Without heeding Rick's warning: "I was willing to shoot Captain Renault, and I'm willing to shoot you," Strasser attempts to halt the plane on the runway - he runs to a phone to connect to the radio tower. Rick orders him to put the phone down as Strasser grabs the receiver. The Nazi leader pulls out a gun with his other hand and fires a shot at Rick - who must in self-defense shoot him. Strasser crumples to the hangar floor - dead. Major Strasser has been shot. Renault: Well, Rick, you're not only a sentimentalist, but you've become a patriot. Rick: Maybe, but it seemed like a good time to start. Renault: I think perhaps you're right. Renault: It might be a good idea for you to disappear from Casablanca for a while. There's a Free French garrison over at Brazzaville [in French Equatorial Africa]. I could be induced to arrange a passage. Rick: My letter of transit? I could use a trip. But it doesn't make any difference about our bet. You still owe me ten thousand francs. Renault: And that ten thousand francs should pay our expenses. Their new partnership is underscored with the triumphant sounds of La Marseillaise.